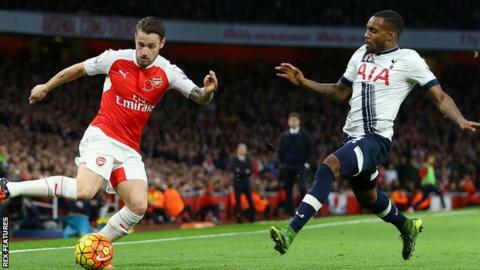 Arsenal defender Mathieu Debuchy could leave the club in the transfer window, says manager Arsene Wenger. Aston Villa, the Premier League's bottom side, have been linked with a move for the 30-year-old Frenchman. "Mathieu has an opportunity to go but we have not been in touch with any club," said Wenger. Meanwhile, the Gunners are continuing talks to sign Egyptian midfielder Mohamed Elneny from Basel with a fee reported to be in the region of £5m. Wenger added: "It is a little bit complicated but we will work hard and get to the end of it in the next few days." He is keen to strengthen in central midfield after Francis Coquelin and Santi Cazorla suffered serious knee injuries, while Aaron Ramsey and Mikel Arteta have also had spells on the sidelines and Jack Wilshere is still absent. Debuchy has played just seven times for the Gunners this season with his last appearance in November's 3-0 Champions League victory over Dinamo Zagreb.